This year’s New York Comic Con at the Jacob Javits Center was its biggest yet, with numbers now rivalling the one in San Diego. If you haven’t been to it, its size and scope is something to marvel at, and really needs to be seen to be believed. 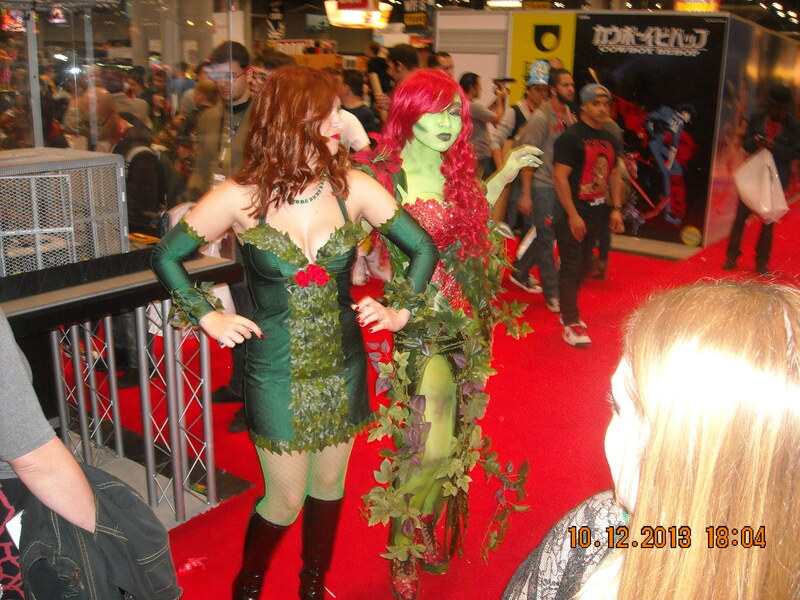 With icons like William Shatner and Stan Lee in attendance, the number of great panels, exhibitors and guests offered plenty for everyone. 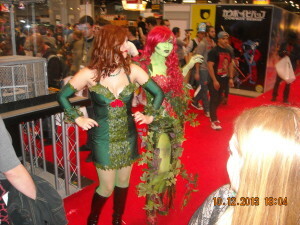 But it’s the sheer number of creative and inventive cosplayers that makes the convention thoroughly entertaining on its own. The following are some highlights and noteworthy events that took place over the 4-day weekend for those who weren’t able to attend this massive event in person. The boys from AMC’s Comic Book Men took the main stage Friday to talk about their upcoming 3rd season. Moderated by their leader, Kevin Smith, it was, as expected, a funny, often times raunchy, panel. While Kevin can easily command a stage by himself for several hours and never fail to entertain, having the guys from Red Bank, New Jersey’s Secret Stash on hand added some great interplay. For anyone who watches the show, a fan asked a question surely on a lot of viewers’ minds. What does the bearded, heavy-set, Bryan Flanagan do at the store? His great answer was he “hangs out and makes fun of his friends,” which is something he does anyway, but since AMC now pays him for it, he has the best job in the world. Of particular note to Gore 4 fans, Kevin talked of his-soon-to-film second horror film, entitled “Tusk.” Starring Justin Long and Michael Parks, it’s the twisted tale of a man who is forced to wear a walrus suit. It’s hoped to be ready for next year’s Sundance Film Festival. Kevin also talked about his upcoming Clerks III, which promises to be epic, and might actually be his last directing effort, as he currently prefers doing his podcasts over anything else. Look for Clerks III in November 2014 in time for the original Clerks 20th anniversary. Kevin’s parting advice for the audience was to do what you love to do, and if you persevere and have some luck, maybe you can get paid for it. With all the mediums for getting your work out there now, it surely is more possible than ever. Next up was Chucky’s 25th anniverary panel, moderated by super-fan, Ain’t It Cool News’ Harry Knowles, with creator/writer/director Don Mancini, plus the voice of Chucky himself, Brad Dourif, Tiffany’s Jennifer Tilly, and star of the newly released “Curse of Chucky” (see our review), Fiona Dourif, Brad’s daughter. Fiona talked about what it was like growing up with “Chucky”, and then, ultimately, getting to act in one of the films. 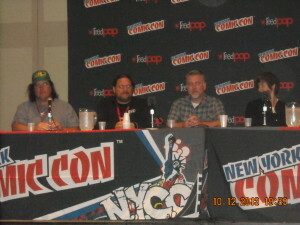 The panel also spoke of after the last two movies had a somewhat comedic slant in addition to the horror, they wanted to bring a scarier, more terrifying approach to “Curse.” And while this newest Chucky was released straight to video, the hope is that it will be successful enough so that Chucky’s further adventures can return to the big screen. 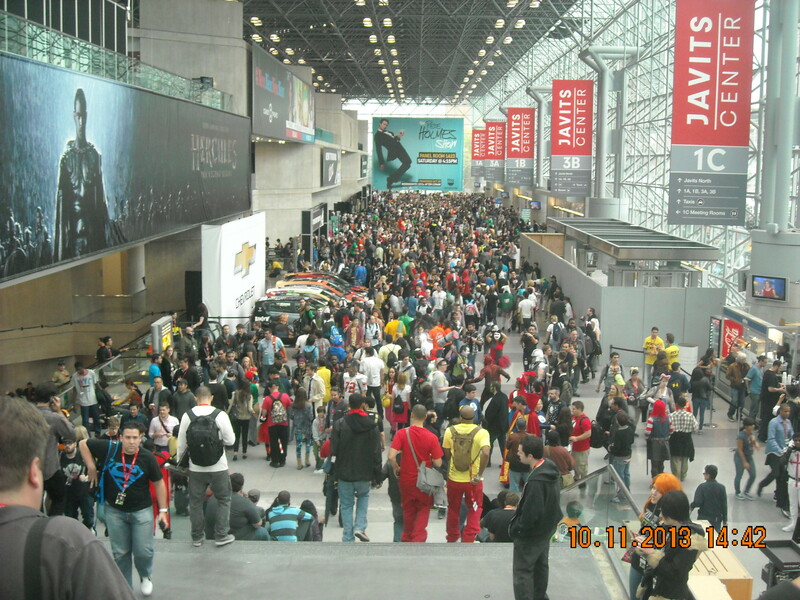 Saturday was Walking Dead day at NYCC, with one panel dedicated to the 10th anniversary of the comics, and another on the main stage devoted to the show. With Robert Kirkman and company on hand, some tidbits of what to expect further down the road from The Walking Dead were brought up, such as new cast members and what characters they’d be playing. But it is interesting how the two storylines diverge between the comic and show, with some characters surviving in the comics though having died on the show, and of course, entirely new characters on the show (Daryl) who were never in the comics. 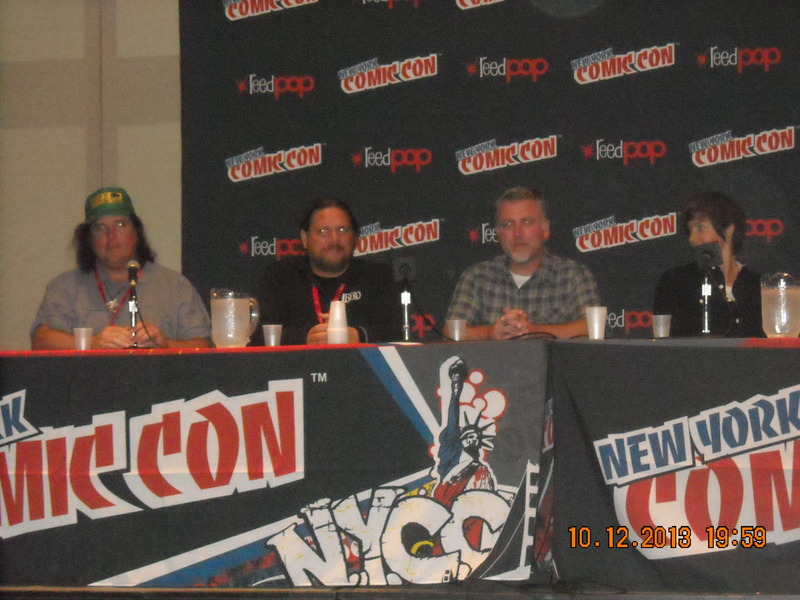 Another great panel Saturday was for Animal Planet’s Finding Bigfoot. This was a fun as well as informative panel that had a number of kids in the audience along with the adults. With all four investigators (Matt Moneymaker, Cliff Barackman, Ranae Holland and James “Bobo” Fay) on hand, they showed a few clips from their upcoming 4th season (premiering Nov. 10). At one point, each of the researchers picked two audience members to do their best squatch calls. Then, everyone in the room called out together in what could surely be heard in the adjacent panel rooms. In referring to the earlier mention of bigfoot diet including deer and elk, the Gore 4 asked if they had any instances of anyone actually observing a bigfoot hunting down such prey. Matt, clearly excited over the question, said that there were some reports, specifically referencing one in New Jersey. In fact, the upcoming season features a trip to the Garden State’s Pine Barrens, which the panel said was very “squatchy.” Also brought up was the investigators’ visit to Nepal in search of the Yeti, which will close out the new season next March. In answering an audience question, Matt and Bobo said that they have actually seen a bigfoot, with Matt bringing up peoples’ general skepticism. However, once you’ve seen one face to face, you unquestionably believe and know that it’s the non-believers who are wrong. On Sunday, NYCC led off the main room with a panel for the Syfy show, Defiance. Featuring cast members Grant Bowler, Julie Benz, Jaime Murray and Stephanie Leonidas, this was a very lively and fun panel, as they were all very entertaining. They spoke of everything from where the show was headed to how long it takes Julie and Stephanie to get their make-up done for their characters. Julie said it took her just as long, even though her character was human. Also discussed was the connection of the show to the accompanying video game and how characters can seemlessly weave in and out of both worlds. This aspect makes Defiance truly unique. The Gore 4 asked how far down the road the show is mapped out, and how much do the actors know about where their characters are headed. Producer Michael Nankin said all of season 2 is planned, and a general layout of seasons 3 and 4 are too. 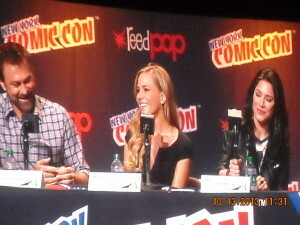 Julie said the producers don’t tell the cast anything, as they would undoubtedly spill the beans to reporters and fans. Another point the cast made was how great it was working for the SyFy Channel. Whereas other networks are broader, and are run by executives that may not be fans of the genre, at SyFy, everyone in charge undestands and loves science fiction. And while detractors like to complain that SyFy doesn’t air enough actual sci-fi, this show dispels that notion, as it is science fiction through and through. So if you haven’t seen Defiance yet, be sure to check out this fascinating future Earth where a number of alien races, along with the native humans, must struggle together and learn from each other if they are to survive. Season 1 just came out on video, and the new season will begin next Spring. 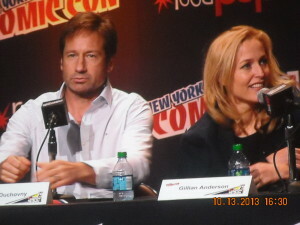 Aside from The Walking Dead panel, surely the most anticipated event at this year’s NYCC was the return of The X-Files’ Mulder and Scully. Celebrating the 20th anniversary of this landmark show, David Duchovny and Gillian Anderson showed the same great chemistry together that their characters had on the show. Things began with David asking the audience to wish show creator Chris Carter a happy birthday, which was that day. As everyone sang, David recorded it on his phone to show Chris. When it came time to take audience questions, when asked what they thought was the biggest conspiracy out there, Gillian responded it was that President Obama was trying to ruin the country by providing health care to everyone. The truth really is out there. Of course, what was on everyone’s mind was whether we’d get to see another X-Files movie. 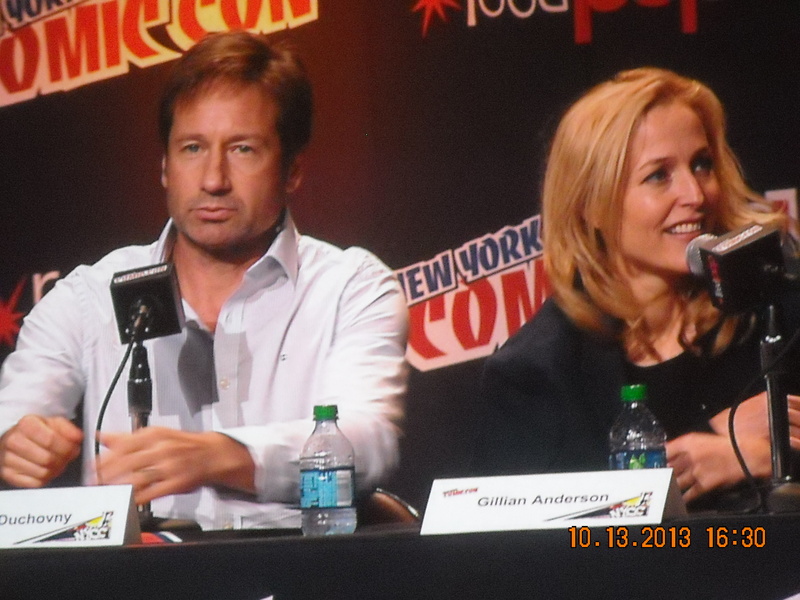 David said that he, Gillian and show creator Chris Carter were all on board-it was now up to 20th Century Fox. Though the last movie proved unsuccessful due to a variety of reasons, hopefully the powers that be will give the show’s countless fans more of Mulder and Scully. And without giving any specifics, David did say that any future movie would most likely return to the show’s alien conspiracy roots. No one can discount the influence The X-Files had on television. 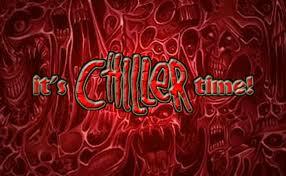 (The show itself was influenced by the short-lived The Night Stalker.) The X-Files’ success opened up television to what the genre could do-provide intelligent, thought-provoking, yet entertaining and fun storylines. Surely, the television landscape would look very different if not for The X-Files. Everything from Battlestar Galactica and Lost to The Walking Dead and Supernatural owe a bit of gratitude to the show that opened up the door for all of them. In fact, if not for The X-Files, Comic Con would also very likely be a much different event, and not have the same size and scope it currently has. So, here’s to 20 years of Fox Mulder and Dana Scully, and hoping they’ll get the chance to search for the truth once again. World War Z gets unrated Blu-ray Sept. 17!